Sandals All Inclusive - The Best of All Inclusive Luxury. Our credited Sandals Specialist at Arriva Travel, will guide you through the many Sandals Paradises in the Caribbean, and find the one that is best for you. Your every desire, however great or small, is catered to with the utmost attentiveness...leaving you to focus only on each other. We have personally visited all the Sandals properties in the Caribbean, we work very closely with them and we can tell you which one of the Sandals properties is the best fit for you. Our travel consultants are Certified Sandals Specialists. Here below find some of the great selections of Sandals. call us at 914-428-6611 or contact susan@arrivatravelonline.com a Sandals certified specialist. Sandals Emerald Bay, Great Exuma, Bahmas. On a faraway island surrounded by a crystalline sea lies and exotic private escape. Nestled along the sun-kissed shores of an exclusive peninsula on Great Exuma you will find Sandals Emerald Bay, which will bring you and unprecedented level of luxury. Sandals Great Exuma lays on an incredible powdery white sand beach where service is elevated to an art form and where championship golf a world class SPA and contemporary oceanfront accommodations harmonize with sea, sun and serenity. From the moment you set off on your scenic journey to Sandals Whitehouse, you're immersed in the natural beauty of the Jamaican countryside, boasting rolling hills that hug a stunning coast. 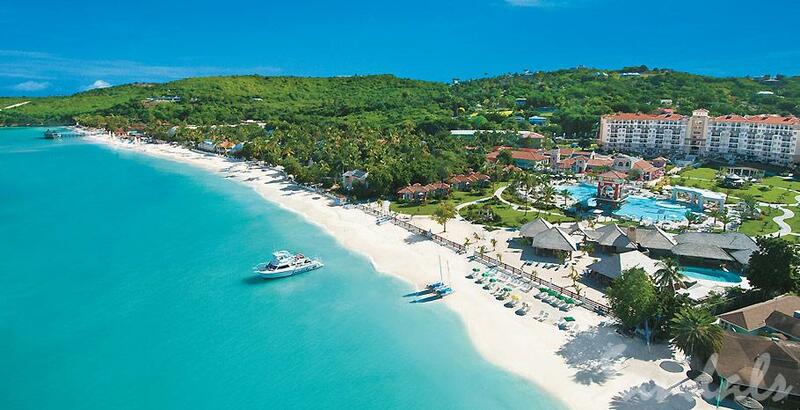 Sandals Whitehouse emerges amidst this unspoiled splendor. Its grandeur is immediately apparent- a regal, palm tree-lined entrance opens up to reveal a majestic beachfront European oasis within a 500-acre nature preserve. Strolling along a grand piazza lined with bistros, restaurants, cafes and bars, it's easy to forget that you are in the Caribbean. After all, Sandals Whitehouse could just as easily be in Europe, given the sophisticated ambience that reflects some of the continent's most remarkable cities. There are three distinctive European villages to be found ( French, Italian and Dutch) amidst an all beachfront backdrop and each has its own unique vibe that transports you to another world. The only all inclusive St. Lucia resort cradled on both sides of the Caribbean Sea, Sandals Grande St. Lucian's sheltered mile-long beachfront is home to the calmest waters in all St. Lucia. Loyal guests often describe this Sandals gem as the "closest vacation to a picture postcard" with its awe-inspiring panoramic views of historic Ft. Rodney and volcanic mountains rising from the azure waters. The Grande three-story lobby of this St. Lucia resort is reminiscent of a British palace and the gathering place for cocktails and tantalizing afternoon buffets accompanied by the soothing sounds of a grande pianist. Everything aquatic is at your beck and call, with an alluring dive reef just five minutes away. Five fresh water pools beckon- rejuevenate in a Sandals signature pool with swim-up bar, immerse in romance in the beachside heart-shaped pool for lovers, or glide from your living room into the exotic lagoon pool. Give in to total indulgence in the one-of- a kind Presidential Suite or a Grande Rondoval suite-in=the round with our own private pool. Spanning Negril's famed Seven-Mile Beach, Sandal's Negril vacations conjure up tropical vibrations with a casual, understated elegance. Stroll through walkways dotted with swaying palms and sea breezes, while listening to the Hypnotic sound of waves. Experience romantic moments created by the most amazing sunset at the Caribbean's ultimate beach resort. Savor world-class cuisine at breathtaking oceanfront restaurants. Relax and enjoy luxurious accommodations, just steps from the beach, including some of the most unique suites in the world with butler service where you can swim-up to your private patio.